This study provides an in-depth evaluation of earnings differences within and across countries and their evolution over time using three different waves of the Structure of Earnings Survey (SES) – for 2002, 2006 and 2010. Earnings inequalities for the EU stayed roughly constant at a Gini coefficient around 0.3 with, however, large and persistent differences being observed across countries. The crisis had no significant impact on changes in earnings inequalities of those people remaining employed. 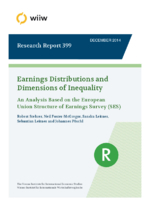 The report highlights the impacts of individual, job and firm characteristics on earnings differences applying Mincer regressions and provides information to which extent these determinants contribute to the observed earnings inequalities using a Shapley value decomposition approach: Differences in earnings by occupation and education are the two most important determinants of wage inequality contributing with about 25% and 12%, respectively, followed by industry (with about 10%), enterprise size (about 6%), job duration (6%), age (5%) and gender (3.5%).